Hedge funds are often mistaken to be very similar in risk to other types of investments, and although they are often measured through the same types of quantitative metrics, hedge funds have qualitative risks that make them unique to evaluate and analyze. In the following section of this tutorial, we'll evaluate some of the most common risk metrics used in hedge fund analysis as well as some of the broad qualitative issues that should be evaluated. Unfortunately, a full evaluation of all quantitative and qualitative hedge fund risks is beyond the scope of this tutorial. Unfortunately, and particularly when related to hedge funds, standard deviation does not capture the total risk picture of returns. This is because most hedge funds do not have normally distributed returns, and standard deviation assumes a bell-shaped distribution, which assumes the same probability of returns being above the mean as below the mean. Most hedge fund returns are skewed in one direction or another and the distribution is not as symmetrical. For this reason, there are a number of additional metrics to use when evaluating hedge funds, and even with the additional metrics, some risks simply cannot be measured. Another measure that provides an additional dimension of risk is called value-at-risk (VaR). VaR measures the dollar-loss expectation that can occur with a 5% probability. In Figure 2, this is the area to the left of the vertical black line on the left of the graph. This provides additional insight into the historical returns of a hedge fund because it captures the tail end of the returns to the down side. It adds another dimension because it makes it possible to compare two funds with different average returns and standard deviation. 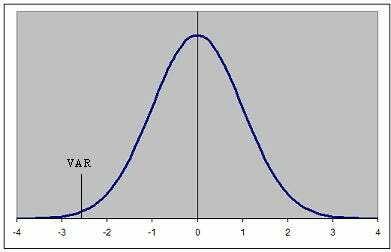 For example, if Fund A has an average return of 12% and a standard deviation of 6%, and Fund B has an average return of 24% with a standard deviation of 12%, VaR would indicate the dollar amount of loss that is possible with each fund with a 5% probability. In relation to hedge funds, and in particular those that claim absolute return objectives, the measure of downside capture can indicate how correlated a fund is to a market when the market declines. The lower the downside capture, the better the fund preserves wealth during market downturns. This metric is figured by calculating the cumulative return of the fund for each month that the market/benchmark was down, and dividing it by the cumulative return of the market/benchmark in the same time frame. Perfect correlation with the market will equate to a 100% downside capture and typically is only possible when comparing the benchmark to itself. Another measure of a fund's risk is maximum drawdown. Maximum drawdown measures the percentage drop in cumulative return from a previously reached high. This metric is good for identifying funds that preserve wealth by minimizing drawdowns throughout up/down cycles, and gives an analyst a good indication of the possible losses that this fund can experience at any given point in time. Months to recover, on the other hand, gives a good indication of how quickly a fund can recuperate losses. Take the case where a hedge fund has a maximum drawdown of 4%, for example. If it took three months to reach that maximum drawdown, as investors, we would want to know if the returns could be recovered in three months or less. In some cases where the drawdown was sharp, it should take longer to recover. The key is to understand the speed and depth of a drawdown with the time it takes to recover these losses. Do they make sense given the strategy? Despite the additional quantitative metrics available for the analysis of risk, many of which were not even covered in this tutorial, qualitative risks are as important if not more important, particularly when evaluating hedge funds. Since they are unregulated pools of funds and their strategies are more complex, it is imperative that a thorough analysis be completed on items other than numbers. One of the most important evaluations is that of management. A fund must have good, strong management just like a company. A talented hedge fund manager with strong stock-picking abilities may perform well, but his contribution to success will be blunted if the fund is not managed properly. The same could be said of back-office operations, including trading, compliance, administration, marketing, systems, etc. In many cases, a hedge fund will outsource many of the non-investment functions to third-party firms, and we will cover some of these service providers later in the tutorial. But whether they have some of these functions in-house or if they are outsourced, they need to be at a level that allows for the effective functioning of the investment management process. For example, it is critical to have adequate systems to measure risks within a portfolio at any given time, so that the hedge fund manager can feel confident that his strategy is intact throughout. It is also important for trading systems to be able to implement the hedge fund manager's ideas so as to maximize the expected returns of the investments and to minimize trading costs that would otherwise harm returns. Scale is another measure that is critical to a hedge fund's success, and although one might use quantifiable metrics to evaluate scale, it takes a subjective opinion to determine whether a fund's strategy will be impacted by having too large of a fund and by how much returns will be affected. Hedge fund managers often answer this question by providing both a soft-close limit and a hard-close limit to new funding, in addition to their opinion on how much they can actually manage and still be effective. When analyzing hedge funds, the important thing to remember is to look beyond the numbers and statistics. An investor can be lured into an inappropriate investment if the qualitative factors mentioned above are not analyzed within the context of the overall strategy. While there are some risks that should be unconditional, such as management integrity, there are others that can vary by hedge fund strategy. Only after a comprehensive and detailed analysis of all risks can one truly understand the investment. Hedge funds can be an integral part of a well-diversified portfolio - if you know how to choose them. HF Performance Report: Did Hedge Funds Earn Their Fee in 2015? Find out whether hedge funds, which have come under tremendous pressure to improve their performance, managed to earn their fee in 2015. Are Hedge Funds Chasing Performance? Learn why hedge funds have performed worse than the S&P 500 Index in 2016, and why they may overweight equities to play catch-up in the second half of 2016.